Residents of a Lavender Hill home were arrested this morning after police gathered information indicating that drugs and firearms were kept on the premises. The couple is expected to appear in the Wynberg Magistrates’ court on Monday. Reserve Bank Governor Tito Mboweni has announced a 100 basis points repo rate cut. The bank’s monetary policy committee met over the past two days to consider a rate cut. The announcement was made earlier than usual today. The 100 basis point cut is within expectations and is good news for people who have debt and large mortgages. Dr Ayanda Ntsaluba, Foreign Affairs' Director General yesterday briefed the media on current and international issues at the Union Buildings. In the briefing he covered the outcome Durban review conference. Ntsaluba expressed his concerns about a number of countries that did not attend. Foreign Affairs' Director General, Dr Ayanda Ntsaluba briefed the media yesterday on current and international issues at the Union Buildings in Pretoria. He discussed confirmations for Jacob Zuma’s inauguration on May 9th. According to Ntsaluba forty-two countries have responded to invitations to the inauguration and twenty of these have indicated they will be sending their heads of state. According to reports it has also been confirmed that Zimbabwean President Robert Mugabe is also invited. On Tuesday police arrested five people at Borchards Quarry Road in Airport Industry for Possession of illegal firearms, ammunition and possession of a stolen vehicle. The incident occurred when police busy on routine patrols noticed a suspicious black Nissan bakkie in the same area, the vehicle’s registration number was checked and discovered to be stolen in Table View last month. Police Inspector November Filander says police eventually managed to stop and search the vehicle. The five suspects aged between 27 and 38 from phillipi, Langa and Nyanga were arrested on scene. The suspects will appear in the Bishop Lavis Magistrates court today. Six male suspects were detained for questioning in connection with six house Robbery cases which were committed in the areas of Kirstenhof and Hout Bay during the course of this year. Captain Bernadine Steyn says the men were taken in during a police initiated operation supported by a security company and executed in the mountain area between Kirstenhof and Hout Bay. The six men, aged between 25 and 39 years are still being questioned. Steyn added that as the investigation continues, follow-up reports will be issued to the media. The Wasteman Group recently officially opened a new Material Recovery Facility (MRF) at Airport Industria. The recycling plant can process up to 50 tons of industrial and commercial waste per day, helping to reduce the volume of waste going to the City’s landfill sites at Vissershok in Bellville South and Strandfontein, extending their lifespan. Mike Pienaar Regional General Manager says Waste collected from industries in the Airport Industria area will be sorted mechanically into plastics, metal, glass, paper and organic material. Once the plant is running at full capacity it will provide up to 100 new jobs. “Council’s policy is to reduce, re-use and recycle. Cape Town is the first South African city to adopt a waste management by-law,” Pienaar continued. During next year’s Soccer World Cup, the City plans to roll out a split bin system in strategic public areas to recover recyclable materials,” he says. From Sunday, May 3 2009 to Thursday, May 7, Eastern Boulevard inbound carriageway will be closed to traffic from the De Waal Drive split at the top of Hospital Bend from 11pm until 5am. During these times all city-bound traffic on Hospital Bend will continue towards the city centre along De Waal Drive. This will enable contractors to complete the temporary support structures for the construction of the new De Waal Drive Bridge over the Eastern Boulevard inbound lanes. Traffic travelling to town via Eastern Boulevard will be diverted from De Waal Drive inbound to De Waal Drive outbound via an existing break between the carriageways and then via Upper Roodebloem Road onto Eastern Boulevard inbound. Traffic can also stay on De Waal Drive to proceed to the city centre. All detours will be clearly marked. With the Reserve Bank’s Monetary Policy Committee starting their two-day meeting today, economists are predicting a 100 basis point cut in the repo rate tomorrow. Economist say the same cut as last month is expected as the economy is still very much under pressure. Some economists are even predicting a 150 basis point cut, but the consensus is for 100 basis points. Last month’s cut was the third since the beginning of the year. Meanwhile, steel giant ArcelorMittal South Africa has reported a headline loss of 237-million-rands for the first quarter of this year. This compares with a one-point-one-billion-rands profit for the fourth quarter of last year. Chief executive officer Nku Nyembezi-Heita says economic conditions had a significant negative impact on sales and income. Woodstock Police arrested two men for being in possession of suspected stolen property in Wright street and recovered goods worth R15 000. The arrest follows after police were on routine patrols and noticed a grey Chrysler vehicle in Wright Street Woodstock. When the occupants of the car spotted the police they sped off, but the police gave chase and managed to stop the car in Victoria road Woodstock. He says the occupants of the car could not give the police account for the items found in the vehicle. A preliminary investigation later revealed that a motor cycle business situated in Victoria Road Woodstock , was broken into during the night. The suspects will appear in the Cape Town magistrate court on tomorrow. The Democratic Nursing Organization of South Africa acknowledges and commends all Doctors who heeded to the call from the leadership and society at large to return to work. DENOSA spokesperson Asanda Fongqo says this decision illustrates that they have not abandoned their professional convictions and duty to serve society as alleged in certain sections of the media. “It is for this reason that we find it unfortunate that in the middle of the process of them returning to work the department threatens to dismiss some of them, says Fongqo. We further reiterate that those Doctors that have not yet returned back to work should also heed to the call and duly do so, added Fongqo. DENOSA further stresses the significance of unity amongst workers. A water pressure management project, introduced by the City of Cape Town, is saving an estimated R83 million per year. This project forms part of the City's Water Demand Management Strategy which focuses on initiatives, such as public awareness campaigns on water conservation, replacement of old infrastructure, the treatment and re-use of sewerage effluent and pressure management. Mayoral Committee member for utility Services, Alderman Clive Justus said the City’s water pressure management project was introduced in 2001 to reduce leakage during off-peak periods. The most recent large scale pressure management project was a R7.7 million Mitchells Plain project, which supports a population of an estimated 500 000 residents in the area. A bakkie with six children on board, believed to be on their way home from school, was rear ended by another bakkie on Station Road at First Avenue in Kraaifontein this afternoon. ER24’s Tristan Wadeley says the children, between the ages of eight and ten, were seated at the back of the bakkie with a canopy on, when it was rear ended by the other bakkie. The six children were treated for minor injuries and taken by ER24 ambulances to Kraaifontein Day Hospital, says Wadeley. SAPS from Kraaifontein were also in attendance. The City of Cape Town’s Water and Sanitation department is currently in the process of shutting down the water supply, which services areas such as Suikerbossie and Llandudno, due to the rupture on the pipeline. Spokesperson for the department, Farouk Robertson said they had tried to repair the pipe on Saturday but the weather made it impossible. They are expected to complete work on the pipe by 5pm. In this case, the pipeline is below the ground and could complicate things. Robertson added that they will try to restore the water as soon as possible. Emergency Rescue24 paramedics were called out to a rescue mission yesterday afternoon, after a female from Fish Hoek injured herself while climbing at Elsies Peak. The hiker had apparently fallen and broke on of her legs. Tristan Wadeley, spokesperson for ER24 in the Western Cape, said medical crews from ER24, Cape Medical Response, Fire Department and Metro Rescue set off on a one hour hike, with their medical equipment, to reach the patient. Wadeley added that the patient was given analgesia and put in a stokes basket, medical crews then carried her until an area where the she could walk again. 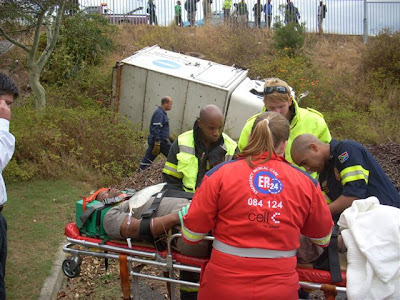 ER24 paramedics were called out to an accident scene, where one person died and two were injured. The accident occurred on Baden Powell drive, between the N2 and Adam Tas drive. ER24 spokesperson for the Western Cape, Tristan Wadeley said it’s alleged that the Toyota bakkie, with the three people on board was being chased by police when the accident occurred. A police vehicle also sustained damage during the pursuit. One police officer was taken by ER24 ambulance to Stellenbosch Medi-Clinic for further assessment. The City of Cape Town departments are co-ordinating their plans to manage flooding and storm damage in the coming months. Trevor Steyn, Spokesperson for the Roads and Stormwater says this will ensure that the City implements a comprehensive plan to manage the inevitable affects of the coming winter storms. According to the South African Weather Services mid-term predictions indicate normal rainfall patterns up until July. Mid-July to August could see higher than usual rainfall. This will probably result in extreme weather conditions with possible local flooding. A technical media briefing by key role players such as Disaster Risk Management, Roads and Stormwater and Development Services will be held today. The Democratic Alliance are still in shock after their colleague and head of the city’s “Drug Busters” unit, Glen Kleinsmith, was found hanging from a cell phone charger cord in his Bellville home at the weekend. Police spokesperson Captain Bernadine Steyn said they did not suspect any foul play, and at least two of Kleinsmith's fellow councillors said they do not believe he committed suicide. Kleinsmith was a ward councilor in Bellville and a DA whip as well as a subcouncil chairman. He was found dead at about 6am on Saturday after he was apparently tied to a cell phone charger cord to his cupboard and around his neck. President Kgalema Motlanthe has urged South Africans to remember and be thankful to those who sacrificed their lives to realize the freedoms that we enjoy today. “A generation of youth sacrificed their lives knowing that they did not have the right to grow up and grow old to live long and productive lives. President Motlanthe was addressing the thousands of people gathered at Durban’s Absa Stadium to mark Freedom Day on Monday. Held under the theme: ‘Together celebrating a vibrant democracy and build in a better life for all’, Freedom Day is a call to all South Africans to be proud of the vibrant democracy. Freedom Day is held each year on 27 April to mark the anniversary of the first democratic elections. South Africa’s fourth General Election took place last week. The Disgruntled people who gathered for Freedom Day celebrations at the Absa Stadium in Durban threw objects and disrupted President Kgalema Motlanthe’s speech when they complained about a poor sound system. Most of the crowd began singing African National Congress songs and Motlanthe was forced to stop speaking while ANC provincial chairperson Zweli Mkhize tried to persuade the crowd to listen. The crowd had begun gathering at the stadium before eight this morning. A large section of the audience wore T-shirts bearing Jacob Zuma’s face. The Confederation Cup balloons were released after the president's speech eventually went ahead. Health officials across the world are scrambling to contain the outbreak of swine flu. The death toll from the illness in Mexico has risen to at least 110.It is reported that new and suspected cases have emerged in other countries as far apart as Scotland and New Zealand. The United States declared a public health emergency as 20 cases were confirmed in the country. The World Health Organisation says the outbreak has "pandemic potential", but the world is better prepared than ever to withstand a pandemic. It stopped short of issuing a worldwide alert. The Democratic Alliance leader Helen Zille will step down as Cape Town mayor on Wednesday when she's gazetted as a member of the Western Cape provincial legislature. The DA won a clear majority in the province in last week's elections, assuring Zille of the premier's post. DA Chief executive officer was quoted saying deputy mayor of Cape Town Grant Haskin will take over duties from Zille until the city council elects a new mayor. The Congress of South African Trade Unions has encouraged people to support Freedom Day celebrations today. However, Cosatu says while there is much to be celebrated, the 22-million South Africans living in poverty cannot be ignored. The trade union federation says the close to 40-percent of the working population who are unemployed and the millions still living in shacks cannot fully celebrate their political freedom as they wait for the chance to earn a decent living and live in a proper home. The Democratic Alliance says it has achieved its three objectives in the election. The party’s chief executive officer Ryan Coetzee says it managed to keep the African National Congress below a two-thirds majority, it won an outright majority in the Western Cape and it strengthen its position as the official opposition. The DA increased its seats in Parliament by 17 to 67. It also grew in eight out of nine provinces, increasing its seats in provincial legislatures from 51 to 65. But Coetzee admits that the DA’s greatest challenge going forward is to win more support from black South Africans. The trade union Solidarity’s monthly food price comparison which has been done among the three largest super market groups in South Africa since the start of the year, this week indicated that food prices increased by an average of 5,5% during the past four months. The price differences of Solidarity food basket furthermore drastically decreased to less than R2,50 between the shopping groups. “Pick ŉ Pay’s prices in the basket rose by 8,1% during the past four months while Spar and Checkers’ food prices increased by 3,1% and 5,1%. These increases place the three super market groups which are monitored by Solidarity almost on equal footing, says Jaco Kleynhans, spokesperson of Solidarity. Kleynhans says Pick ŉ Pay’s financial results have meanwhile been released and indicate that this super market’s profit on continued activities has increased to almost 21% after tax, despite the denial by Mr. Kevin Korb, Pick ŉ Pay’s Director for food purchases in February this year that this super market group will be very profitable this year. Today, on the eve of tough wage negotiations, Solidarity once again appealed to super markets to alleviate the burden of the worldwide economic crisis on everyone by lowering their food prices, added Kleynhans. Two pedestrians, believed to be workers from the Table Mountain National Park Silvermine, were allegedly hit by cash in transit vehicle while they were trying to cross Ou Kaapse Weg at the Silvermine Road intersection earlier this morning. ER24 Tristan Wadeley says medical crews from Cape Medical Response, Metro EMS, ER24, fire services and a doctor in her private capacity worked hard together to stabilize the patients on scene. One of the patients, a male around the age of twenty years old, deteriorated in the ambulance and paramedics resuscitated him to Victoria Hospital where he was declared dead, says Wadeley. According to Wadeley the other patient, a twenty six year old female, sustained major trauma to her left leg but was in a stable condition on scene. 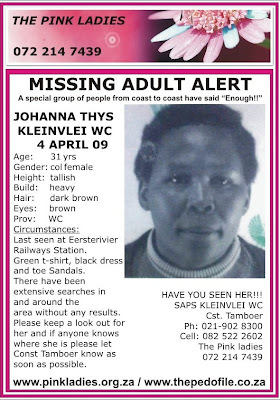 She was taken through to Groote Schuur Hospital for further treatment. Paramedics said thick mist might have been a contributing factor to the incident. SAPS from Fish Hoek and Traffic Department were also in attendance. This morning a Toyota Quantum taxi rolled on the N2, in the direction of Somerset West, near the Raapenberg Road turn off earlier this morning. ER24 Tristan Wadeley says one patient sustained minor injuries and was taken to a nearby hospital. Paramedics on the scene were unsure what caused the taxi to roll. Metro Police, Provincial Traffic, Fire Department and Metro EMS were also in attendance. It is reported that When Jacob Zuma announces his new Cabinet, Finance Minister Trevor Manuel could be appointed as the head of the planning commission, a powerful new structure which will reportedly monitor government performance. According to media reports Manuel’s staff recently held a farewell function for him. It is believed that Zuma wants businessman Cyril Ramaphosa for the finance ministry. Others have indicated that he might want to place fellow businessman and ANC national executive committee member Tokyo Sexwale in trade and industry. African National Congress president Jacob Zuma has proclaimed a new era of hope. He addressed a gathering at the elections results centre in Pretoria after the African National Congress’ decisive victory was officially proclaimed. Zuma vowed that the ANC would use its mandate responsibly and that the party would maintain direct contact with ordinary South Africans. He reiterated that the government under his watch would be tough on non-performers and that there would be a change in the status quo. Zuma also reached out to those who had not voted for the ANC, promising that the new government would work for all South Africans. The Final results show that the African National Congress won a decisive victory in Wednesday’s election. But with 65-point-nine-percent of the vote, it missed the two-thirds majority needed to make constitutional changes unchallenged. The ruling party nevertheless got around a million more votes than in 2004. The Democratic Alliance remains the official opposition with just over 16-and-a-half-percent, and four months after it was formed, the Congress of the People captured just under seven-and-a-half-percent of the support nationally.Voter turnout was 77-point-three-percent . The DA won the Western Cape with a 51-point-46-percent outright majority. The ANC is the official opposition there, with Cope edging out the Independent Democrats for the third place. The ANC took KwaZulu-Natal, with the Inkatha Freedom Party in second place. In Cape Town municipal workers belonging to Samwu have vowed to continue with strike action after yesterday’s protest went off peacefully. They are demanding that the city employs all contract and casual staff on a permanent basis. The union also wants a 26-percent wage increase. The 2009 election was declared free and fair by the Independent Electoral Commission (IEC) as well as election observers. After the long wait, the province is eagerly anticipating the final election results for the Western Cape. The results were expected to be released by late yesterday afternoon, but following unexpected technical as well as logistical problems, the IEC hopes to have them by around 17h00 this evening. In the hotly contested province, the Democratic Alliance (DA)has once again secured the Western Cape in the fourth democratic election. This came as no surprise for the Party, who were convinced of an outright win. However, only the official results will confirm what percentage the DA will achieve. Today the Department of Water and Sanitation will be disrupting the water due to a pipe line that is licking. Spokesperson for the department of water and sanitation Farouk Robertson says the areas that will be affected by this are Landano and Mount roads areas. Robertson says all residents are urged to be patient while technician are trying to resolve the problem. The Independent Electoral Commission says it will make the official announcement of the results of Wednesday’s election in Pretoria at five this afternoon. But the three big provisional winners are the African National Congress which has again been entrusted with running the country, the Democratic Alliance which has taken the Western Cape and the Congress of the People which has become the official opposition in five provinces. It doesn’t look as though the ANC will achieve its predicted two-thirds majority nationally, but spokesperson Jessie Duarte says they are not so concerned about the percentages any more. She says they understand that their mandate is solid and they are very happy about that. The Independent Electoral Commission is expected to announce the results of the 2009 national and provincial elections today this afternoon. “We know that the nation is waiting, but it does not have to wait too long,” said IEC Chairperson Brigalia Bam during a briefing at the Results Operation Centre in Pretoria. In terms of the Electoral Act, political parties may raise objections with the commission if they feel they were unfairly prejudiced in any way, says Bam. The commission said it was currently considering 12 objections submitted by three parties, namely the Democratic Alliance, the Congress of the People and the Inkatha Freedom Party. The commission said once fully considered, it would communicate its decisions to the relevant parties. Counting has been completed in about 94.34 percent of voting districts nationally. This translates into 18 618 voting districts out of a total of 19 734 districts. Ms Bam said the IEC employees and volunteers have done very well. The fitting of the Green Point Stadium’s glass roof, will get underway on Monday, after the inner tension ring was raised two months ago. The City of Cape Town’s technical director for 2010 David Hugo, said everything is going as schedule. The glass structure, made of laminated sheets 16mm thick, will weigh 1 500 tons and fill an area of 37sq km. Engineers hope to finished with the roof construction in September. The roof has been constructed in New York by Birdair, the famed stadium roofing company and designed by German architectural firm GMP Architects. Metrorail seem to have kept their promise that all train services would not be disrupted due to today’s strike action of its two train unions. The rail operator said that contingency plans had been put in place to minimize the impact of the one- day strike in Cape Town. Metrorail spokesperson Riana Scott said that the morning peak hour service was more than 80% functional with some delays reported in the Khayelitsha and Muldersvlei areas. She said several early morning trains were cancelled due to defective sets, resulting in a score of delays but furthermore no incidents were reported and stations confirmed that it was business as usual. Scott says, Metrorail is expecting to render a similar service this afternoon, “we generally experience an earlier afternoon peak on the eve of a long weekend and our employees are ready to ensure that our customers get home on time this afternoon’”. Meanwhile more than twenty three thousand commuters received regular short message alerts on the status of the service and the all hours Metropolitan Transport Information Centre confirmed a standard call flow rate. By yesterday most large employer bodies had been notified of the intended strike and all relevant authorities were alerted. The Democratic Nursing Organisation of South Africa is calling on government to put together a progressive proposal on Doctors Occupational Specific Dispensation (OSD) following the doctor’s strike that is taking place. Fongqo said that DENOSA is now calling on government to resolve this matter as quickly as possible. With the 2009 elections all but done and dusted, analysts are beginning to look at the final overall picture and what the future could hold for some political parties. One of the more obvious results of the election is that minor parties have all but been wiped out by the big three – the African National Congress, the Democratic Alliance and Cope. Another trend that is expected to gain momentum is talk of opposition parties joining forces for the 2011 elections. One of the first leaders to suggest such a move is Patricia de Lille of the Independent Democrats who is still cheerful despite the ID’s poor showing this year. De Lille said that the opposition parties should all stand under one banner in future. The DA has been talking along these lines for some time now, but there is no clear indication yet whether Cope, who enjoys support in Cape Town’s townships, will be prepared to throw their lot in with the DA and ID. The election has indicated that a party like the once potent Pan Africanist Congress, that drove the pivotal Sharpeville pass law protests of 1960, has been relegated to a non-entity. The party could only manage 1.25 % of the national vote this year. Latest predictions indicate that a party would have to have had garnered at least 44 200 votes to guarantee a seat in parliament. The PAC could only muster some 35 886 votes. The Independent Electoral Commission said it would only announce official results and the voter turnout at the weekend. Two people were injured when the light duty truck they were travelling in turned off the road, broke through metal fencing and rolled down an embankment into a parking lot below. By noon today, the Independent Electoral Commission (IEC) in the Western Cape will verify the official 2009 Provincial Election results. The Democratic Alliance (DA) looks as if they have the Western Cape in the bag, as they secured over 51% of the votes in the most contested province. Media waited with bated breath last night, as the IEC announced that by 11pm, the results would be verified. However due to a computer failure at the Results Operation Centre (ROC), the results could only be released by midday. City Traffic Services pounced on dragsters in yet another successful effort to rid the streets of Cape Town of street racing, on Friday and Saturday evening. “By-standers stoned a motorist who started wheel-spinning in the parking area, clearly in disagreement with his actions. He then sped away. Traffic Officers pursued the vehicle and forced it to stop at the corner of Klipfontein Road and Vanguard Drive, where the driver tried to flee. He was apprehended and arrested on suspicion of driving under the influence and for reckless and negligent driving,” said Lourens. The League of Friends of the Blind received reports that Braille templates were not available at some polling stations on Wednesday. Activity at the Results Operation Centre (ROC) slowed down drastically as media, party agents and election observers started adding finishing touches to their final elections reports. By 11h30 the Independent Electoral Commission (IEC) will verify the official 2009 Provincial Election results. 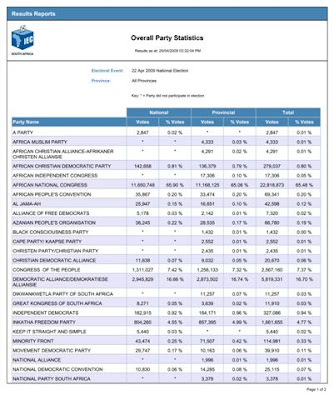 As it stands now, the Democratic Alliance (DA) leads the provincial poll with 586,003 votes, followed by the African National Congress (ANC) with 364, 578. The newly formed Congress of the People (COPE) have secured 91,898 votes tailed by the Independent Democrats who are on 66,199. This year more than 2,6 million people in the Western Province registered to vote. Chief Electoral Officer for the Western Cape, Courtney Sampson, said that the IEC was satisfied with the voter turnout this year. He added that this has been the most exciting election the country has witnessed since the first democratic election in 1994. Despite negative reports, the electoral process went off without a hindrance in the Cape. The IEC said there were no reports of intimidation or harassment at voting stations. Activity at the Independent Electoral Commission’s Results Operation Centre (ROC) seem to be slowing down, as media wait for the official announcement of the results for the 2009 General Election. Everybody at the ROC, which is at the Cape Town International Convention Centre seem anxious as they await the results from various voting districts. 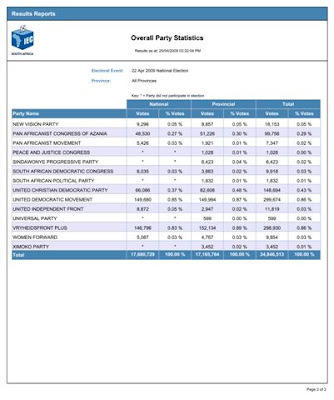 Results from the Winelands district have been released, with the African National Congress leading the polls as the Democratic Alliance secured second place. As it stands now, in the Western Cape, the Democratic Alliance has secured over 50% of the vote in the province while the African National Congress has over 30%. New party on the block, Congress of the People came in third with over 8%. Media at the ROC are eagerly awaiting results from the City of Cape Town district. Three suspects were arrested on charges of attempted murder in Manenberg earlier today. The three are being detained and will make a court appearance once they are charged. The Bus shelters in Manenberg Avenue are to receive celebrity treatment today when Zolani Mahola, lead singer of the afro pop band, Freshly ground, joins a local and a German artist in painting some shelters along Manenberg Avenue. The Colourful Bus Shelters Project is a sustainable livelihood partnership that forms part of the Bauwagen Goes South Partnership project between the cities of Aachen, Germany and Cape Town. According to project manager, Joint Xingashe, the bus shelter project aims to engage people from different backgrounds in different projects to raise awareness for the Edith Stephens Wetlands Park bordering Manenberg. “Zolani supports the initiative which empowers the children of Manenberg to express themselves through the arts, music and culture,” says Xingashe. “The murals will depict pictures of nature and scenes from the wetland park,” he says. Manenberg painter Steven Niekerk and Uta Göbil Grub from Aachen in Germany have already started to paint some of the shelters. The designs were done by six groups of learners who worked together for a week to share ideas. Freshlyground has been involved with the Aachen-Cape Town Partnership since 2005. They joined the Cape Town delegation to Germany for the fourth anniversary of the partnership. During their stay in Aachen they did workshops with school children and the Aachen jazz band. The body of a new born baby was founds this morning in a waste bin after the Woodstock Police was alerted by a member of the public. The police are investigating an inquest docket at this stage. Anyone with information can call the investigating officer at the Woodstock Police, Detective inspector Godfrey Johns, on 021-4423141. The Democratic Alliance (DA) is convinced of an outright victory in the Western Cape. While figures are looking positive for the party, it is all speculation at this point. The Western Cape is one of the most contested provinces in the country, and has never been out rightly taken by any party. “The DA is looking at a very good result. We are looking at a result way over 40%, and if all our voters turned out we stand an absolute chance of having an outright majority,” said DA media liaison Coenraad Bezuidenhout. Chief Electoral Officer Courtney Sampson cleared up some logistical issues faced by the IEC. This following rumours that the IEC had run out of ballot papers. Sampson reiterated that this was not the case. In those situations, the IEC saw to it the extra ballot papers were delivered to the necessary voting stations. Sampson expressed his regret that people had to stand in long queues before casting their ballots. He blamed this on the logistical nightmare, as voters made their way to which ever polls they wanted to vote at, instead of making their mark where they had registered. “Long queues is always an ugly thing to be standing in. It really frustrates people. It causes a lot of anxiety, it causes anger and it should not happen,” he said. As IEC official Granville Abrahams addressed the media and political parties in the final media briefing for the evening, voting results started trickling in at the Results Operations Centre (ROC). Abrahams explained the seat allocation calculation before political parties contesting in the Province began making rough estimates. According to the IEC, votes were counted at 1541 voting stations, before being captured in 31 capture venues and finally sent to 10 results centres across the country. Once results are captured and audited they are sent back to the ROC. The ROC was almost silent, eagerly watching as exit polls were displayed on the two big screens. Activity at the Results Operation Centre (ROC) died down after the Chief Electoral Officer in the Western Cape, Courtney Sampson, addressed the media. The IEC is facing a logistical nightmare, as voters are now taking to the polls in any voting district, instead of where they registered to vote. This has resulted in long queues and voters having to wait extra long to cast their ballot. “At the moment, what we’re trying to do, is just to manage this uncomfortable, unhealthy environment, where people have to stand in long queues and get agitated and ensure that we manage the conflict,” said Sampson. Because of additional voters pitching up at various stations, some stations are faced with stationery shortages, including the lack of ballot papers. This means that the IEC has to deliver extra ballots to polling stations. With only a few hours to go for South Africans to cast their ballots, official observers are pleased that stations are running smoothly. Nomfundo Walaza, Observer for the Electoral Code of Conduct Commission (ECOCC) says that voting stations are running efficiently and that voters are surprisingly calm this year. “We have been doing this since 2004, as ECOCC, and this is the third time we are doing a national election. It seems as if things are much calmer this time. So far, so good,” she said. Walaza said what was interesting for her was that voters weren’t even “perturbed” that people who were standing in the queue wore party political t-shirts. Things haven’t exactly been running according to schedule here at the Results Operation Centre (ROC) today – with two media briefings being over-looked. However, voter turnout statistics were regularly handed out. 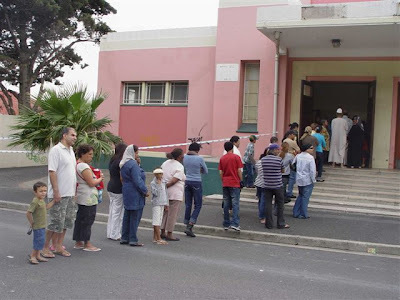 By 15h30 the results received by the Independent Electoral Commission (IEC) said that 232,075 registered voters had pitched up to make their mark at voting stations in the City of Cape Town - mere 13,49% of the registered voters in the City. Political parties can only hope that all registered voters make their way to the polls before cut-off at 21h00 this evening. Police officers stationed at all polling stations across the City are on high alert in case any violence breaks out. However, the voting process seems to be running smoothly, with no major occurrences of violence reported at this point. “Since early this morning, we haven’t received any major reports,” said Police spokesperson Senior Superintendent Billy Jones. says at this point, no extreme cases of violence has been reported. “We have strategic groups that are in the nearby vicinity, if the stations require assistance,” said Jones. 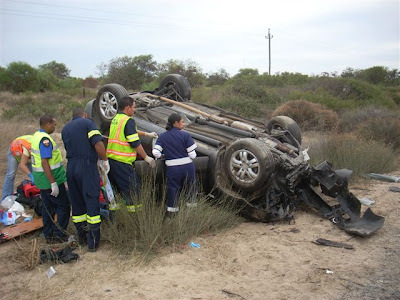 A crashed between two vehicles on the R27 between the Melkbos and Duynefontein turn-offs has left two people dead and another two in a serious condition. ER24’sTristan Wadeley says the two occupants of the one vehicle were declared dead on arrival of emergency services. It appeared as though one of the occupants had been ejected from the vehicle, and the other man was still trapped in the vehicle. “The two patients from the other vehicle, a man and woman both believed to be in their fifties, which were still in their vehicle that was lying on its roof by the side of the road, were taken out by rescue crews from the fire department and Metro Rescue, the 'jaws of life' had to be used to help free the one patient,” says Wadeley. The R27 was closed in both directions during the incident; SAPS and Metro Police were in attendance. A patriotic shiver went down the spines of those watching, as the country’s favourite citizen, former President Nelson Mandela, cast his vote in the 2009 General Elections. Voting came to a temporary halt at the Killarney Country Club in Houghton, where a special ballot box was set up for Madiba. Wearing his famous Madiba shirt in a bright yellow, and a black overcoat to keep away the morning chill, with his trademark AIDS badge, pinned to it, Madiba proudly walked into the voting station with the help of his cane and Gauteng Premier Paul Mashatile. Over 100 journalists, photographers and voters witnessed as he cast his vote in the presence of the Independent Electoral Commission Chairperson Brigalia Bam. After casting his vote, the country’s most popular citizen, better known as tata (father), cast a glorious smile at the cheering crowd and waved.Madiba, now 90 years old, could have qualified for a special vote, but he instead chose to get out of bed and brave the chilly weather to make his mark, an inspiration to all citizens that if he could do it then so could they . Meanwhile, outside the voting station, a queue with hundreds of voters snaked its way around the block; among the voters were Dali Mpofu and Tokyo Sexwale. While thousands of Capetonians took to the polls today, operations were slow at the Independent Electoral Commission ( IEC) Results Operation Centre (ROC)held at the Cape Town International Convention Centre (CTICC) this afternoon. Few political parties were present at the ROC and most media houses were on a bus tour to various voting stations across the Cape. By 13h40, the number of voters who had cast their ballots in the City of Cape Town stood at 195,312. That figure represents 11,36% of the 1,719,878 registered voters in the same district. The number is expected to increase dramatically over the next few hours, while voting stations are to speed up operations. As the 2009 General elections starts, political interest amid young South Africans is at an all-time high. Amongst others, many first time voters will take to the polls. Because most young people were not actively involved with the apartheid struggle, emotional voting will not necessarily play a role when making a decision on who to vote for. Last week Bush Radio arranged an open discussion, to which we invited first time voters to openly discuss the general elections. With each new generation comes a new way of thinking. Thus, many youth vote for parties that appeal to their morals and beliefs. In some cases, parents shape and form their children’s ways of thinking. But for some, their intellect and reasoning will be the deciding factor. Trevor Davids, an official from the Independent Electoral Commission, joined in on the discussion to answer questions about the voting process, as well as other issues surrounding the elections. Davids said that nearly 91 000 new people between the ages of 18 -29 in the Western Cape registered to vote in the elections. Of that, about 26 000 were between the ages of 18 -19 years. “That’s a power in terms of numbers that an age group has – and it’s growing and it’s growing exponentially,” he said. No one knows exactly what is in store for the youth of South Africa post elections day, but what is certain is that who ever governs will have to consider the new generation in any decision taken. I feel pretty good, maybe make a little difference, every vote counts I guess. Well firstly I think I’ve done my part for obviously our country and all the generations to follow. It is quite important to cast your vote because at the end of the day we are going to be living in the country and we also need to bring our part in ensuring it’s what we want it to be. I feel great now that I have voted, one thing I like is for us to be together as a nation. I feel privileged excited it’s the first time I’m making my voice heard and I hope that whoever wins helps. Relief, I just hope my vote can make a difference. The Independent Electoral Commission in the Western Cape said they were satisfied with the voter turnout in the Western Cape thus far. The City of Cape Town, by 8:30 this morning, recorded a 87 176 voter turnout. Chief Electoral Officer in the Western Cape, Courtney Sampson briefed the media earlier , to review the opening of voting stations in the Western Cape and the reveal the challenges. 98% of the voting stations across the province were fully operational by 7 this morning, this means that 3 or 4 stations were not functional at 7am. Due to the late delivery of voting materials, these stations were only operational at 8am. However, Sampson said they were satisfied that all IEC staff were at their respective voting station by 7 this morning. He reiterated that the turnout of voters pleased them “tremendously”. Police were despatched to a shooting incident which took place during the early hours of yesterday evening in Westbank, Mfuleni. On their arrival they found the body of a 17 year old victim, known as Maselino Kleinsmith where he was lying on the sidewalk, close to his house situated in Cantara Street. Captain Anneke van der Vyver says the victim sustained several gun shot wounds to the head and body. Police immediately questioned residents and onlookers. “The deceased then tried to escape but the suspect gabbed hold of him. The other suspect also joined in and threw the victim to the ground, says Captain Van der Vyver. Constable Matras, the Investigating Officer made a breakthrough soon after the incident took place. A 17 year old suspect, believed to have been one of the three suspects involved, was arrested at his house situated in Waterberry Street, Westbank,says Captain Van Der Vyver. Police are urging the public to assist them in their investigation into the incident. Anyone with information is requested to contact the Investigating Officer, Detective Constable Stoffel Matras on 021 - 900 5500 during office hours or on 072 608 3871 or the Detective Commander, Superintendent Nomdo on 082 778 7106. Five people were injured when a Fiat Uno and Toyota bakkie crashed on Jip De Jager Road at the N1 on ramp in Bellville yesterday evening. 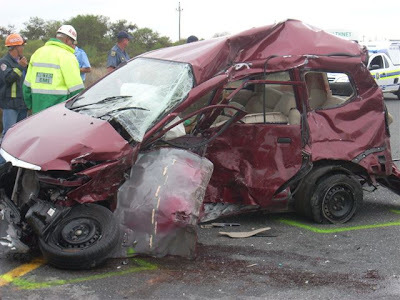 Peak hour traffic was badly affected by the accident, SAPS and traffic department were also in attendance. MEC for Health in the Western Cape, Marius Fransman, has confirmed that he has received the report on the investigation they have launched into the death of Unabantu Mali. The Minister will study the findings of the report and then hold discussions with the City of Cape Town’s Health Department and the Mali family. Only then will the report be made public. According to a report, the conclusion of the investigation was received last week but the investigation team, led by Advocate Denzil Potgieter, requested an extra week to continue its work as it wanted to interview more people. The request was granted as Minister Fransman wanted the team to thoroughly investigate what and come up with recommendations on how services can be improved at the health facilities. The report also investigates the birth of Yonela Mangena, whose mother gave birth in front of a clinic, after she was refused entry. A heavy presence of police indicates that security has been extremely tightened and police are on guard in case of any violent outbreaks. Government has deployed the National Police to many of the hotspots around the country. At the ROC, political parties trickle in where many putting up their party banners and posters. Election Observers are also starting to enter. The Independent Electoral Commission (IEC) is also doing their last round of checks in hope that everything runs smoothly today. It has been estimated that in the Western Cape, 2.6 million voters are registered and this is also the expected number of voters to turn out today. This is said to be the most contested elections since 1994. The IEC has however reiterated that everything is under control for election’s day. The only worrying factor was however the weather. The Eastern and Northern Cape can expect rain today but the rest of the country can expect reasonable weather for voting day. A girl around the age of ten years old was hit by a Toyota Yaris and killed on Lansdowne Road between Symphony Way and Stock road in Phillipi earlier this morning. SAPS and Metro police were in attendance and will be investigating the incident. The investigation by the City of Cape Town, into the number of fires that occurred at the beginning of the year across the peninsula, is still continuing. South Africa’s Foreign Affairs Director General, Dr. Ayanda Ntsaluba, briefed the media today on current and international affairs at Union buildings in Pretoria. Ntsaluba said as far as the general elections are concerned, everything as gone well so far. They are also satisfied with the report they have received from the Independent Electoral Commission. Ntsaluba added that they have deployed a team of Foreign Affairs in London, for assistance. Meanwhile IEC chairperson Brigalia Bam has described the enthusiasm shown by South Africans living abroad in voting at missions last week as “incredible”. Bam says the IEC is confident the enthusiasm will be felt in South Africa tomorrow too. The Independent Electoral Commission says not even bad weather will prevent it from making it possible for all of South Africa’s more than 20-million registered voters to have their say tomorrow. Predictions of heavy rainfall in KwaZulu-Natal, snow on the Drakensberg and wind and rain in the Eastern Cape have raised fears that ballot papers may not be able to be delivered or that tents at temporary election stations could be blown away. Electoral officials say helicopters are on stand-by to deliver ballot papers and contingency plans are in place should poor weather prevent them from flying. IEC chairperson Brigalia Bam, who will have little time to celebrate her birthday today, says they are doing everything in their power to counter the effects of bad weather. Bam has described the enthusiasm shown by South Africans living abroad in voting at missions last week as “incredible”. All seven-thousand-427 people registered in London brought out their votes. The League of Friends of the Blind [LOFOB], a encourages all blind people to vote on Wednesday, April 22 as provision has been made to ensure a secret ballot is set out for blind people. Executive Director for LOFOB, Philip Bam said that this is the first time that the ballot will be totally secret for people who are Braille literate. The City of Cape Town has been notified by the South African Municipal Workers Union (SAMWU) that it has embarked on a strike. City of Cape Town’s Media Manager, Kylie Hatton, says a group of approximately 100 people gathered outside of the Civic Centre. SAMWU has not applied to congregate outside of the Civic Centre, in terms of the Gatherings Act. The City’s Executive Director for Safety & Security, Mr Richard Bosman, has made himself available to receive a letter from the group on behalf of the City Manager, says Hatton. The City has also given a representative from the group a copy of the letter that it has sent to SAMWU’s regional offices, she said. Residents are advised that service delivery will not be affected and contingency arrangements have been put in place to ensure that services continue, said Hatton. Motorists using Plattekloof Road are warned that the City’s Roads and Stormwater Department will start essential maintenance work on the section between Bosmansdam Road and Gert van Rooyen Street from 9am tomorrow morning. To limit the disruption of traffic, vehicles will be accommodated on the shoulder of the roadway. Work will only take place on weekdays. If the weather remains favourable (no heavy rain) maintenance will be completed within two weeks. A stop-go system will be in place and motorists are requested to be patient and to proceed with caution. A few radio stations in Cape Town seem to be experiencing difficulty broadcasting, due to a Telkom signal failure. Bush Radio is temporarily off air, as well as CCFM, Good Hope FM’s primary feed and e-TV’s contribution feed. Gary Urion, Supervisor at Sentech, said their team has investigated and found that the Telkom lines were down. Urion said they were waiting on Telkom to assist them. Bush Radio’s Programme Integrator, Adrian Louw, apologised to the Bush Radio listeners and said it was very frustrating as the station was to air its final elections debate. He added however that it was out of Bush Radio’s hands. * The transmission interruption was corrected at 16h25. * The election debate will be played at 19h00 - 21h00 tonight. The City of Cape Town’s Traffic Services department, held an operation on Thursday night in Eerste River, to ensure road safety and to curb illegal street racing. The most concentrated areas were the Stellenbosch Arterial and Wesbank Main Road. Chief Inspector for Traffic Services, Merle Lourens, said that when they arrived on the scene, an estimated 20 cars and 50 spectators were milling around. The drivers scrambled to get to their vehicles, started performing and wheel-spinning. In an attempt to get away, a number of vehicles also disregarded stop signs. Fines were also issued on the night. 19 for disregarding the stop sign, 29 unlicensed drivers, 15 unlicensed vehicles, 19 for defective lights and 20 other defects to the value of R46 800. Six motorists were also fined for not having number plates fitted to their cars. Lourens said they are making every effort to rid the city of illegal racers. The City of Cape Town has experienced quite a lot of in the last couple of months. As a result Roads and Stormwater will be working closely with SA National Parks to counter and confine mud slides which might occur on Devil’s Peak this winter. · Cleaning all stormwater drains below the burnt areas to limit the possibility of blockages and flooding. · Placing gabion weirs where needed in the stream courses to intercept debris and slow the flow of water down the slopes. Gabions are wire mesh baskets, filled with rocks. “It is imperative that potentially affected property owners take steps to limit their exposure to damage should these measures not prove sufficient,” says Cllr Thompson. · Ensuring that private drainage facilities on your property are checked and maintained in good working order. · If you live next to a burnt area, encourage plant growth by watering a 10m wide band of land above your boundary. · Check for burnt and dead trees that could fall onto your property and notify the authorities if there is a danger. For trees within Table Mountain National Park land call 021 689 4441. For trees within the municipal area call 021 689 4184. · Place sandbags where necessary to protect critical areas in and around your property. If there is a threat of severe flooding or debris flow through your property, select a route through the property that will cause the least damage and use sandbags to try and confine the flow to that route. It could be a pathway or stairs for example. For sandbags and advice on where to place them, contact the City’s Ebenezer Roads and Stormwater Depot on 021 400 3310. · If your neighbour’s boundary walls are diverting mountain slope and stream runoff onto your property, bring this to their attention as it is illegal to divert such runoff onto another property. You can report any such diversion to the City’s building inspectorate on 021 400 6482. · Check your insurance policy with respect to coverage for flood damage. · For flooding emergencies call 107 or 021 480 7700 or 0860 103 054. Four unknown males walked up to 31 year old Melikhaya Mtati and shot him point blank in the head, in Tsunami informal settlement in Delft yesterday. According to Captain Joe Wilson, the Investigating police Officer cannot determine the motive for the attack and there seem to get very little cooperation from the public in that vicinity. Wilson says the deceased subsequently died on the scene and that the attack occurred in broad daylight and someone should have witnessed the incident. The deceased stayed in Tsunami and was visiting his brother when he was shot who stayed in another section. Anyone with information is requested to contact the Investigating Officer, Detective Constable Pieter BONTHUYS at Delft (T) 021 954 9000 or (C) 082 411 3087. Unknown persons brought a critically injured male to Delft Day Hospital on Saturday night. Captain Joe Wilson says they gave his personal details as, 25 year old Simphiwe Seyibonke residing at 133 Thabo Mbeki Street Khayalitsha and left the hospital. Captain Wilson says deceased was stabbed 18 times with a sharp object and the address given was false. Wilson said that police were in the dark and do not know where the crime occurred and nor the crime scene nor the perpetrator/s had been identified. Anyone with information is requested to contact the Investigating Officer, Detective Inspector Glentyn Manuel at Delft Saps, (T) 021 954 9000 or (C) 082 411 3087. The 2009 general election entered its second phase this morning with special votes being cast across the country. After last week’s voting by registered voters abroad, South Africans who will not be able to vote on Wednesday are now being given the opportunity. The Independent Electoral Commission says the special votes system, today and tomorrow, is mainly for the physically disabled, pregnant women, election officials and security force members who will be on duty on election day. Those who will be temporarily out of the country on Wednesday for either business or pleasure also qualify. But only people who are registered to cast a special vote will be allowed to do so. Formula One driver, Sebastien Vettel gave his team, Red Bull racing their first ever victory yesterday, when he lead throughout the Chinese Grand Prix. This was Vettel second win of his career. He edged out his team-mate, Mark Webber, by 10.9 seconds. Championship leader, Jenson Button of Brawn was third, extending his lead after three races to six points. Button's Brawn teammate Rubens Barrichello was fourth, holding off the McLaren pair of Heikki Kovalainen and Lewis Hamilton, who had just one pit stop, as did seventh placed Timo Glock of Toyota. A crime operation dubbed ‘Prosper’ conducted over the weekend in the Khayelitsha resulted in the arrest of 9 suspects on possession of drugs. Thousands of people attended the rally of the Congress of the People in Seshego in Limpopo. COPE’s leader Mosiuoa Lekota and the party’s presidential candidate Mvume Dandala are expected to tell those present how they plan to rid the country of corruption, poverty and what Cope describes as ‘questionable public health and education systems’. Meanwhile in Cape Town, Western Cape Premier Dr. Allan Boesak, delivered the keynote address today in Retreat. The rally was attended by more than 100 people and Bush Radio reporter Yamkela Xhaso attended. Xhaso said Boesak’s address brought hope to the people of Retreat. The Independent Democrats (ID) electioneering machine has drawn to a close in Delft in the Western Cape, today. Scores of campaigners pitched-up in support of the ID, despite the cold and rainy weather covering the Cape skies. ID Leader, Patricia De Lille’s speech focussed on an array of issues affecting the general populace. The theme fuelling De Lille’s final rally was the overwhelming acceptance of the solutions proposed by the party. “South Africans have responded overwhelmingly to our solutions,” said De Lille. She also took a swipe at other political parties. The ID appealed to youth calling on all first-time voters to cast their ballot in order to have a say in the country. The party is hopeful of a 3-4 percentage national turn-out at the electoral. Former president of South Africa, Nelson Mandela, made an appearance at the African National Congress rally in Johannesburg today. The crowd burst into cheer when a golf cart, transporting ANC leader Jacob Zuma and Mandela, drove through the stadium entrance. Bush Radio reporter, Hector Mawonga, who is at the Nyanga Stadium, said certain members of the crowd threatened to ruin the event when many started pushing and broke down the barriers, resulting in may certain now on the grass. Meanwhile the Independent Democrats ended their campaigning in Delft today. Leader of the ID, Patricia De Lille said this was a culmination of a long campaign which has seen her visit all nine of the country’s provinces. Supporters have descended on the Johannesburg Stadium, awaiting ANC leader Jacob Zuma’s address today. Zuma is also expected to crossover to the Nyanga Stadium where many supporters braved the wet and windy weather to attend the siyanqoba. Bush Radio reporter Mishkah Anthony is at the rally today. She said despite the rain, the turnout is huge. It’s estimated that 8 000 supporters are at the stadium. Meanwhile 21 people have been rushed to hospital after a bus rolled on the on the R55 this morning. The bus was transporting ANC supporters to the rally at Coca Cola Park and apparently collided with another vehicle. The car failed to stop at an intersection and collided into the bus before the bus rolled and came to a halt on its side. The Progressive Youth Alliance (PYA) Siyanqoba rally held at the University of the Western Cape (UWC) on Saturday has pulled out all stops in a final attempt to woo young voters. PYA is an umbrella body consisting of the African National Congress Youth League (ANCYL); South African Students Congress (SASCO); Congress of South African Students (COSAS) and the Young Communist League. The rally was jam-packed and received wide support from students and youth alike. Music artists Slikour kicked off the rally by entertaining the youthful crowd. Supporters donned bright ANC T-shirts and waved ANC flags and banners in the air, while chanting songs referring to Congress of the People (COPE) leader Terror Lekota as a dog who split the ruling party. Guest Speaker and Young Communist League (YCL) National Secretary, Buti Manamela received enthusiastic cheers from the crowd. He launched a scathing attack on DA leader Helen Zille for using botox, while many poor South Africans were in need of food and education. Manamela said he was happy that in just four days left to the general elections that the “youth of the country remains behind the ANC. “A vote for the ANC means we are voting for a leadership that is clear of corruption,” said Manamela. Political parties were out in full force this weekend, in an effort to acquire more supporters. 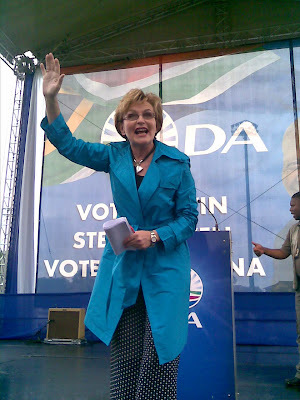 The Democratic Alliance leader, Helen Zille, addressed a crowd at the Stephen Reagan Sports Complex in Westridge, Mitchells Plain this morning. In her address, Zille said every South African has the right to exercise the power of their vote and that their choice will mean the difference between success or failure for South Africa. Meanwhile the Congress of the People went head to head with other parties as Deputy President for the party Mbhazima Shilowa and Western Cape Premier candidate, Dr. Allan Boesak, addressed thousands of supporters in Khayelitsha today. Singer Zwai Bala entertained a 6 000 strong crowd with dongs of hope. In Parkwood, Independent Democrats supporters descended to the Parkwood’s Sports Field to hear Acting President for the Young Independent Democrats, Xanthea Limberg, deliver a key mote address. Performers at the event included Salomie and youth drama group Uthando. A fire at a Paarl printing company, which left 7 people dead, was said to spread so fast that almost the entire factory was destroyed. At this stage, nobody can reveal how the fire started but an investigation will be launched soon. The Drakenstein fire department said 13 workers are being hospitalised, many of them with second degree burns. A spokesperson for Paarl Medi-Clinic said seven of the fire victims had been admitted to the Medi-Clinic. Two were in a normal ward and five in the intensive care unit. They were being treated for flash burns and inhalation wounds. Political parties around the country are wrapping up their final campaigning activities this weekend ahead of Wednesday’s fourth democratic general elections. The Democratic Alliance held their final campaign rally at the Steven Regan Sports Complex in Mitchells Plain today. The crowd was addressed by leader by Helen Zille. Bush Radio reporter Hector Mawonga was at the rally and said despite the overcast conditions, residents were out in full force. Meanwhile the Independent Democrats Youth Wing will address the Cape Town Youth Rally today at the Parkwood Sports Field. Bush Radio reporter Mandisi Tyulu is at the rally and said most youngsters are trying to warm themselves up, by playing soccer. Although it is raining, this does not kill the mood at the event. Xanthea Limberg, the Acting-President of the Young Independent Democrats, will address the crowd today. The Congress of the People will hold a mass rally at Site C in Khayelistha, which will be addressed by both Western Cape Premier Candidate Dr. Allan Boesak and Chairperson for COPE, Mbulelo Ncedana. Bush Radio reporter Mishkah Anthony is at the rally and said the rally was running behind schedule. Approximately 4 000 people are at the rally today. Political parties will be on the campaign trail in full force this weekend in a final push in the run up to the general election next week. The Democratic Alliance will hold its final campaign rally at the Steve Regan Sports Complex in Mitchells Plain today which will be addressed by Helen Zille. The Inkatha Freedom Party’s second last event will be in Thokoza before wrapping up its campaign in Nseleni tomorrow. While, the Freedom Front Plus’s last meeting will take place in Pretoria along with the African Christian Democratic Party. The United Democratic Movement and Independent Democrat’s final campaign meetings take place in Cape Town tomorrow. Congress of the People’s final rally will be in Limpopo tomorrow with its leadership descending on Seshego. But, the focus will be on downtown Johannesburg tomorrow morning when 120 000 people fill Coca Cola Park and Johannesburg Stadium to listen to ANC President Jacob Zuma. Political parties were on the campaign trail in full force this weekend in a final push in the run up to the general election next week. Bush Radio’s Yamkela Xhaso was at the rally and said that the venue is already half full but people are still coming in large numbers. There was also a band on hand to entertain the crowd. Everyone was said to be extremely excited and awaiting the DA campaign bus. The Independent Electoral Commission in the Western Cape launched the official Results Operation Centre (ROC) for the April 22nd General Elections. The Opening Address was given by Provincial Electoral Officer, Courtney Sampson. Sampson said the IEC had done its best to ensure that they are able to respond to the needs of the voters. Sampson continued by saying that the IEC will seek to deal with any challenges in the quickest possible way to ensure that the voting process will be as “unimpeded”. The ROC will allow media, election observers and political party representatives to have access to the latest information and developments at the election polls. FIFA has started informing hundreds of thousands of football fans as of yesterday that they got tickets to see matches at the 2010 World Cup in South Africa. Fans from 205 countries had requested a total of more than 1 million- 800 tickets in the first sales phase and the holders of 555 871 tickets were successful during this week’s computerised lottery, performed in England. South Africans have been granted the bulk of the tickets. A total of 245 948 hundred tickets, will be sent to South African residents. More than 69 000 tickets will go to the United States and almost 40 thousand to England. FIFA says the World Cup final was the most popular match while England was the most in-demand national team to go and watch. The second sales phase begins next month. The South African Security Forces, comprising inter alia of the South African Police Service, South African National Defense Force and the National Intelligence Agency, will be safe guarding the Indian Premier League matches which will be taking place at eight stadiums in six Provinces namely Gauteng, the Western Cape, the Eastern Cape, KwaZulu Natal, the Free State and the Northern Cape. Captain Dennis Adriao says the ability of the South African Security Forces to safe guard major events has been internationally recognized with 141 international events having taken place in South Africa since 1994 without any serious incident. “We are confident that we have the capacity to ensure a safe and secure environment for the 2009 General Elections to take place freely and fairly and to safe guard the Indian Premier League matches. The South African Security Forces have the ability to handle multiple events in various Provinces, said Captain Adriao. Security measures will be in place at all stadiums and spectators that are unruly or fail to comply with security arrangements will face possible prosecution. A zero tolerance attitude to crime or unruly behavior will be enforced. Certain areas and streets in and around the venues will be closed to traffic during these events, added Adriao. A construction worker was badly injured yesterday when a pallet of bricks fell on him at a construction site in the Century City area. The paramedics took every precaution in preparing the patient for transport to hospital and used full spinal immobilisation. Safety officers on the site were investigating the incident.